How can I link “Household” relationships between contacts in Wealthbox? In Wealthbox, there are two ways to easily link “Household” relationships between your contacts. 1. Navigate to one of the contact profiles you wish to link. 3. Choose the “Household” label from the drop down list and then give your Household a name. On the contact record, click “Link a contact” within the “Family Members” panel on the right of the page. In the “Find contact name” box, search for the contact you would like to link. Choose the household title from the drop down list. 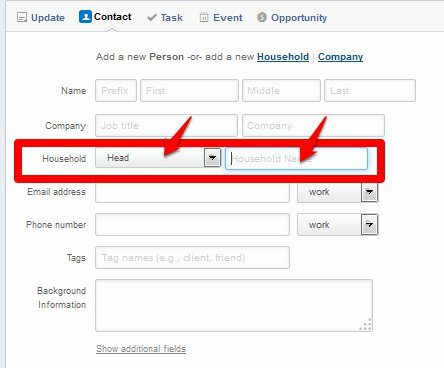 Keep in mind…if you don’t already have a “Household Name” included for the contact record you are working from, the system will automatically create a Household name for you…(the last name and a number). For best practices, you may want to create the Household name first.